The Biffy® Personal Rinse is a wonderful device that connects to essentially any toilet bowl. It provides complete personal hygiene quickly, conveniently and privately; and, it's simple to use! The Biffy® has a compact spray arm that mounts discreetly under the rim of your toilet bowl. A gentle push on the Biffy handle positions the spray arm and delivers a gentle shower of fresh tap water to cleanse and refresh you completely. Release the handle and the spray arm automatically shuts off and returns to its resting position under the rim. It's as simple as that! The Biffy is self-cleaning, requires very low maintenance and is engineered for durability. 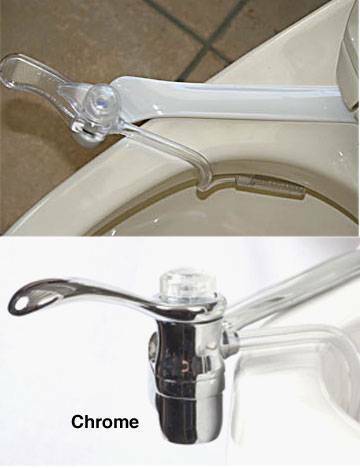 The Biffy simply attaches to your toilet bowl and tank water supply. It can be installed by virtually anyone. 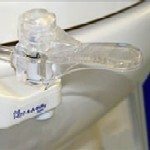 Although the Biffy offers the benefits of a bidet, it is a lot more convenient, works much better and costs far less. Try it...discover how clean and fresh you will feel! Safe for all ages - even toddlers! 1. Sit back comfortably and naturally on the toilet seat. 2. Use your right hand to push the handle backwards until a comfortable spray is felt. Position the Biffy for optimum cleansing. 3. To stop spraying, release the handle allowing it to return to its resting position. 4. The Biffy Personal Rinse is self-cleaning and completely hygienic. Your choice of regular or chrome!